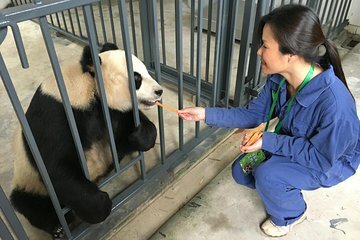 Obtenga la oportunidad especial de ser voluntario en uno de los principales programas de rehabilitación de pandas de China, Dujianyan Panda Base, en esta experiencia de 10 horas de Chengdu. Bajo la supervisión del personal del centro, prepare comida para pandas, limpie los recintos y alimente a los pandas con bocadillos. Incluye almuerzo bufé y transporte de ida y vuelta desde su hotel de Chengdu. Ayuda al personal a limpiar los recintos de los pandas y prepara los alimentos para los pandas. Aprende sobre los esfuerzos de rescate y rehabilitación del centro. Transporte de ida y vuelta desde los hoteles de Chengdu. Comience su día en la base de Dujianyan Panda con la recogida a las 7:10 am en su hotel de Chengdu, después de lo cual viajará aproximadamente 1,5 horas a Shiquiao Village. Una vez que llegue a la base del panda, se encontrará con el personal y se convertirá en un equipo de voluntarios. Obtenga una orientación sobre la historia de la instalación y su misión: el estudio del control de enfermedades y el rescate de pandas salvajes. La base alberga alrededor de 40 pandas, incluido el conocido Tai Shan. Pase el día preparando alimentos para los pandas y limpiando sus recintos, haciendoles pedazos de bambú y dándoles de comer. Aprenda sobre la biología y el comportamiento de los pandas, así como también sobre lo que puede hacer para avanzar en los esfuerzos de conservación de esta especie en peligro de extinción. Los voluntarios deben venir preparados para un día completo de trabajo; el recuento diario de voluntarios está limitado a 30 participantes, y se requiere un certificado de salud. Al mediodía, tómese un descanso para un almuerzo buffet, y luego pruebe el té Panda mientras aprende más sobre el panda. Alrededor de las 3:30 p.m., partirá para el viaje de regreso a Chengdu y dejará en su punto de partida original. 5pm Llegada al hotel de Chengdu donde concluye este tour. * Existe una cuota diaria de 30 voluntarios. Great day out .for people wanting to do more with the pandas and away from the busy local parks. A touch expensive but it’s a one off trip. The guide was amazing her English was superb, her general knowledge about China was great. This trip is for individuals, couples or families. Picked up from hotel by guide Andy and spent a great day with him at the Wolong Panda Research Base as "volunteer" Panda keepers. Was able to clean the Panda enclosures, prepare their Panda Bread and feed them by hand up close. Lots of opportunities to observe them in the preserve as well. Included a delicious lunch with the other Panda keepers. A most memorable experience that we will never forget. The tour organized by Alvin through MyPanda Tours is highly recommended. Well-organized, planned and executed. Visiting the Panda Base at Dujiangyan was the highlight of our 2 week visit to China. Seeing this beautiful animals so close its a fascinating experience. By volunteering for a day you become a part of a global effort to to save this endangered species. But most important is a proof that if humanity wants, it can be done! We had an amazing day with Alvin. From the moment he picked us up, he was incredibly friendly and knowledgable. During the day, when we had down time he took us to see all the other pandas and talked us through some specifics about them. He works with them so regularly that they recognize him and he knows their personalities. It was really fun to volunteer and get right next to the pandas! It was such a fun day and the pandas are just so wonderful! Thank you so much Alvin! We love you! Make sure Alvin is your guide! He is the founder of My Panda Tour and really gets what people want. He understood that we don't get to see pandas every day and went out of his way to make sure we spent as much time around them as possible. He also focused on the stories of each panda and built emotional connections between them and the other people I volunteered with. Run, do not walk, to sign up for this tour. This is a great way to see the Pandas and how they live behind the scenes. I would skip the panda holding, but the panda feeding is pretty amazing. This comes with a driver, and in my case an amazing guide. Thanks Alex Xia! This day was a total dream come true! Alvin was the best tour guide I've ever had, and thanks to him this was the most incredible experience ever! At Dujiangyan Panda Base, volunteers get an intimate experience with many of the Giant Pandas while being helpful by cleaning, breaking bamboo, and preparing panda cakes (a special snack the pandas enjoy). Alvin was unbelievably generous, helpful, and informative with the other volunteers and me. At the end of the day, I could not believe it was over, and I was immediately telling my family that we need to all come back and do the tour with Alvin again! This was a really great experience. It's almost a day long but not at all strenuous and you get to do quite a few things - clean the panda enclosures, feed them, help prepare food for them including smashing bamboos, interact with the staff at the base who are really friendly, and watch a video on the panda conservation along with good food. Thoroughly enjoyed the whole thing and learned a lot about these beautiful and cute animals. I would definitely recommend this to everyone. My day started with Alvin picking me up at the hotel. I had planned this trip alone and was joined by one more of his guest. He is an amazing guide to have, very knowledgeable and personable, extremely passionate about pandas and a great host and storyteller. He made our 1.5-hour ride to the base feel like 15 min. He also took us to the best Wonton place in town. This day was everything I had hoped for and more. My guide Alvin was so friendly and knowledgable about pandas. He was great company for the day. All the staff were very welcoming and supportive. I carried out all my panda keeper duties with careful and thorough explanation from the panda keepers. I learnt a great detail but also had a lot of fun. The setting is breathtaking and the centre not commercial at all. I got to spend a lot of time just observing different pandas and was able to take lots of photos. The day went far too quickly. My highlight was being able to meet a panda by making the suggested donation. Even though it is expensive it is brilliantly orchestrated and worth the money totally. The entire day was a complete success and went far too quickly. I highly recommend it and I would love to return. Thank you.